Photographer is Ella L. Buck of Fort Atkinson, Wisconsin. Otherwise undated and unidentified. I suspect the combination of the chair’s height and the backdrop’s perspective make him look taller than he is, but maybe it’s just the opposite, that he’s a giant making everything else look small. I ended up with a bunch of photos purchased together that were all from Fort Atkinson or nearby places like Milwaukee. They aren’t labelled, so I can’t be sure if they are related in any way, but it’s fun to stare at faces and try to find a family resemblance. 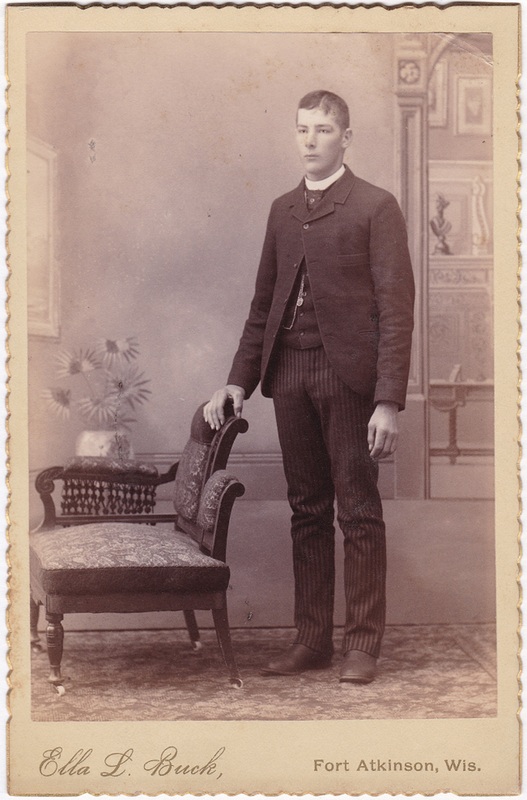 Though it is undated, the card’s layout and the clothing make me think it comes generally from the range of 1885-1895, though I am happy to hear if anybody has a better suggestion. Also, when I looked at the enlarged scan, I saw that somebody had manually drawn black dots to enhance his eyes. It was done well enough that I didn’t notice it before. The deckled edges are 1890s. Nice image and I agree about the forced perspective. I suppose deckled edges move in and out of vogue. In the 1950s when I worked in a photo studio belonging to Matt’s grandfather, they were also very popular. I spent many hours trimming the edges of photos with a deckled paper cutter. Wasn’t it rare to have a female own a photography studio back then (if Ella is female)?